Succulents are plants that hold water in their leaves, such as cacti, aloe, and echeveria. They have captured the hearts of crafters, decorators, and plant lovers all over the world. Always popular as an outdoor plant in warm climates, succulents have found a new popularity as a try indoor plant that's easy to care for and fun to look at. Idiot's Guides: Succulents includes: - Everything needed to select, pair, pot, and care for succulent plants. 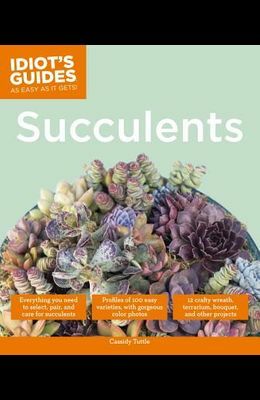 - Snapshots of 100 of the most popular varieties of succulent plants, including care, color, hardiness, pairing, and a full-color photo for each. - 16 beautiful craft projects with how-to steps and color photos, including picture frames, wreaths, terrariums, centerpieces, and bouquets. - Tips on successfully propagating new succulents from existing plants. - Extensive advice on choosing pots and unique planters, repotting succulents, and pairing varieties for maximum impact. - An index of succulents by color and height that gives readers another tool for selecting the succulents that will look.